The winter school holidays may be coming to an end, but the National Sports Museum gave Victorian kids an incentive to rally for their schools and sporting clubs with a one-off competition that launched this Monday July 15. 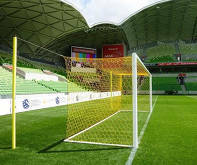 The National Sports Museum is offering Victorian-based schools and clubs the opportunity to win the actual set of soccer goals used at the highly anticipated game at the MCG between Liverpool FC and Melbourne Victory on Wednesday July 24. Victorians can get their hands on this valuable prize, courtesy of Abel Sports and worth approximately $5,000, by telling the National Sports Museum in 30 words or less why they deserve to win the elite Australian made goals for their school or club. The completion will run from July 15 and July 31, 2013, with entrants able to submit their entries online at www.nsm.org.au. National Sports Museum Manager, Jed Smith said he was thrilled to be able to offer Victorian clubs and schools the chance to win the goals from the historical match. “Liverpool FC is one of the world’s most successful and famous football clubs. This is their first-ever visit to play on Australian soil and we’re delighted that we’re able to share a piece of this momentous game with our very own up-and-coming soccer stars,” said Smith. The National Sports Museum is located at Gate 3, MCG, Yarra Park, Jolimont and is open daily from 10am (check www.nsm.org.au for details).